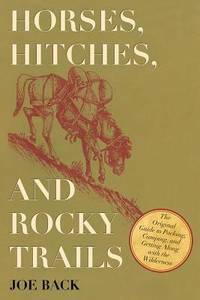 Horses, Hitches and Rocky Trails. Denver : Sage Books, (1959). First edition, first printing. Octavo. 117,  pp. Numerous full page illustrations after Joe Back. Publisher's light brown cloth with dark brown cover and spine lettering, pictorial endpapers of packing gear done by Back, blue dust jacket with a rd pack horse illustration after Back. Jacket price-clipped and with protective thin strip of blue vinyl tape to top and bottom edges (matches jacket color). A very fresh and clean copy in a very handsome dust jacket with no chipping or tears. Often referred to as the Packer's Bible, this book has attained an almost cult-like status. Aside from knowing everything about packing, Joe Back was a very accomplished artist and that can be seen in the many illustrations in this book. Skyhorse Publishing. PAPERBACK. 1626360294 New Condition. . New. Skyhorse Publishing. PAPERBACK. 1626360294 Like New Condition. . Fine. 2018-10-15. New. Ships with Tracking Number! INTERNATIONAL WORLDWIDE Shipping available. Buy with confidence, excellent customer service! 2001-03-06. Good. Ships with Tracking Number! INTERNATIONAL WORLDWIDE Shipping available. May not contain Access Codes or Supplements. May be ex-library. Shipping & Handling by region. Buy with confidence, excellent customer service! Sage Books / Swallow Press, 1987-01-01. Hardcover. Used:Good. Johnson Books. Used - Acceptable. Ships from the UK. Former Library book. Shows definite wear, and perhaps considerable marking on inside. 100% Money Back Guarantee. Your purchase also supports literacy charities. Johnson Publishing. Hardcover. 0933472064 New Condition. . New. Johnson Books. PAPERBACK. 1555661416 New Condition. . New. Sage Books, 1959 First edition. DJ has a few small tears/chips, edge wear, creases, minor scratches, rubbed corners/spine, slightly stained. Boards have edge wear, rubbed corners/spine. No writing. . First Edition. Cloth. Very Good/Good. 2018-10-15. Good. Ships with Tracking Number! INTERNATIONAL WORLDWIDE Shipping available. May not contain Access Codes or Supplements. May be ex-library. Shipping & Handling by region. Buy with confidence, excellent customer service! chicago: sage books, 1959. Hardcover. Very Good/Near Fine. a very nice clean solid copy and jacket with just light wear. Johnson Books, 1983. Hard cover. Very good. Sewn binding. Cloth over boards. Audience: General/trade. The Packers Bible". Denver: Sage, 1959. Book. Good. Hardcover. Inscribed by Author(s). First Edition. 1st printing. Cloth. 117pp. Illustrated with drawings by the author. Endpaper drawings by the author. Presentation copy dated June, 1959, to a couple and signed "Joe and Mary Back." Laid in is a well-executed original drawing of rope, on now brown paper; could be by Back. It has the recipient's name on it, but may not be by the recipient. Covers quite thoroughly foxed. Tiny label on bottom of spine. No dj. Reading copy but collectible because of inscription. Very scarce title nonetheless..
Johnson Books. PAPERBACK. 1555661416 Like New Condition. . Fine. Denver, CO Alan Swallow: Sage Books, 1959. Hardcover First Edition (1959), unstated in accordance with Sage's customary practice at the time of publication. First Edition (1959), unstated in accordance with Swallow/Sage's customary practice at the time of publication. Very Good+ in Poor DJ: The Book shows the very slightest spine lean and a former owner's name and date at the top of the front free endpaper. Else, flawless; the binding is secure; the text is clean. Free of any creased or dog-eared pages in the text. Free of any underlining, hi-lighting or marginalia or marks in the text. A handsome copy, structurally sound and tightly bound, showing minor, unobtrusive flaws. The DJ is split along the rear hinge and only held together by the mylar cover; else shows 3/4" loss at the heel of the backstrip and smaller chip at the head of same; a couple of tiny tears; some toning around the outside edges; very faint soiling; the price is intract; mylar-protected. Not unattractive, at least in its mylar-protector. NOT a Remainder, Book-Club, or Ex-Library. 8vo. (8.75 x 5.85 x 0.65 inches). 117 pages. Foreward by Pat Murray. Liberally illustrated with 51 drawings by the author. Decorated Endpapers. Language: English. Weight: 10 ounces. Front cover error: "Joe Black". Hardback with DJ. Paperback. Very Good. Boulder", Colorado: Johnson Books," 1998. 29th printing. Softcover. 5 ½ x 8 ½ . 117 pp. Very good. The interior appears unmarked. The binding is solid. Denver: Sage, 1959. Hard Cover. Fair/Dust Jacket Included. Older hardback. 1959 Sage printing. Heavy wear and soiling to jacket. Moderate wear to boards. Webbing visible next to title page. Owner's name on title page. Text is clean, unmarked. (Shelf location: T) All items carefully packed to avoid damage from moisture and rough handling. Tracking included. Skyhorse Publishing, 2013-11-06. Paperback. Used:Good. Johnson Books, 1994-06. Paperback. Good. Sage Books / Swallow Press, 1987. Hardcover. Good. Johnson Books. Used - Good. Ships from Reno, NV. Shows some signs of wear, and may have some markings on the inside. 100% Money Back Guarantee. Shipped to over one million happy customers. Your purchase benefits world literacy! Bower House, 1959. Paperback. Acceptable. Disclaimer:A readable copy. All pages are intact, and the cover is intact. Pages can include considerable notes-in pen or highlighter-but the notes cannot obscure the text. At ThriftBooks, our motto is: Read More, Spend Less.Dust jacket quality is not guaranteed. Johnson Books. PAPERBACK. 1555664776 Special order direct from the distributor . New. Johnson Books. PAPERBACK. 1555664776 . New. Johnson Books. PAPERBACK. 1555664776 Remainder mark . Fine. Sage Books, January 1959. Hardcover. Good - Cash. General use wear, surface and edges rubbed with some creasing. Corners bumped and show wear. Pages show reader wear. Secure pages, solid binding. Unmarked pages. Stock photos may not look exactly like the book.